Marketing is all about ascertaining consumer needs and satisfying them profitably. One of the emerging branches of marketing is digital marketing, that has changed the way in which marketing is performed in yesteryears. It is a channel for advertising and selling directly to the consumers, that has a global reach. Digital Marketing uses all digital channels to build awareness and promote the product and services to the target audience. It includes online marketing, social media marketing and mobile marketing. Social Media Marketing is often contrasted with digital marketing, but they are not the same, as in social media marketing is just one component of digital marketing which uses social media as a platform to reach customers and build relationships with them. This article excerpt helps you to understand the difference between social media marketing and digital marketing. Meaning Social Media Marketing is a form of marketing that uses social media sites, forums and blogs to promote product or brand and create awareness about them. Digital Marketing implies promoting and attracting customers, through all digital platforms including internet based and non-internet based channels. Concerned with Engaging with the social media user, in the best manner. Reaching the target audience through different digital marketing platforms. The process of promoting a product or service and building a strong relationship with customers through different social media channels is called social media marketing. Here, the term Social Media, is nothing but a platform that allows the users to share their messages, stories, images, audio, etc. directly to the people connected with them. Social media helps marketers to make their presence online and establish a public voice. Further, the success, growth and engagement of the users can be tracked easily through the data analytics tool provided by these networks. The three primary social media channels are forums, blogs and social network, such as Facebook, Twitter, Google plus, Linkedin, Youtube, Instagram, Pinterest and so forth. 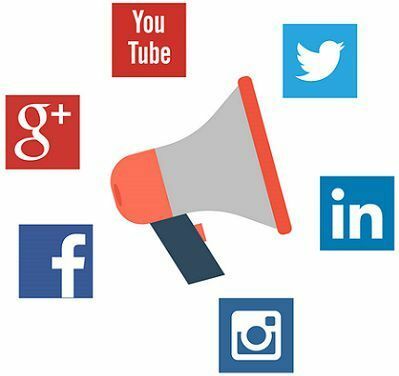 There are two ways of doing marketing through social media; the first one is free, which starts with making connections and increasing followers on social media, by sharing some valuable content, inviting participation from consumers, etc. The second way is paid advertising, For instance: You might have seen sponsored ads, on social media, such as facebook, twitter, etc. By the term digital marketing, we mean a form of marketing that uses electronic channels especially the internet, to promote the product, services, brands and company. 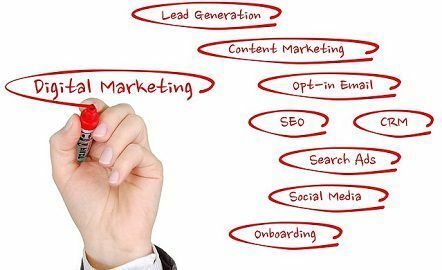 Internet-based methods of digital marketing include content marketing, content automation, search engine optimisation, search engine marketing, e-commerce marketing, social media marketing, email marketing. However, non-internet based methods encompass marketing through radio, television, SMS, MMS etc. Online Marketing: It includes communication options such as websites, search ads, display ads or banner ads, email ads, etc. Social Media Marketing: It advertises products or services through forums, blogs and social networking sites such as Facebook, Twitter, Youtube, etc. Digital marketer keeps an eye on the recent market trends in essence what is highly viewed, how frequently it is viewed and which type of content is liked by the public, and so forth. It is omnipresent, as the information can be accessed from any place anytime. Social Media marketing is a type of marketing that uses social media sites, to boost the traffic and increase customer engagement. On the other hand, digital marketing refers to the modern marketing technique, which uses all available and cost-effective electronic channels to promote products or services and increase customer reach. In social media marketing, the reach is limited to the boundaries of the social media sites and so does the internet. Conversely, digital marketing does not rely only on Internet-based platforms, as it can also be performed offline and so, the reach is comparatively wider. In social media marketing, content is regarded as the king and so the better the content is, the more will be the customer engagement. On the other hand, in digital marketing focuses on the banners, to create an impression on the minds of the customer. In social media marketing, the marketer aims at actively engaging with the social media user. Conversely, digital marketing stresses on reaching the target audience using different channels such as TV, radio, mobile apps, email ads, search ads and so forth. If you compare the speed of a product advertised on social media and digital media, then obviously social media will win as the reach is faster. This is due to an active response of the user, in the form of like, share, comments and statuses, which helps in reaching a larger audience in seconds and so digital media is slower. To sum up, it can be said that social media marketing is a part of digital marketing. The best thing about these two marketing techniques is that the marketer can easily track the impression, through analytics such as number of visits/views, engagements/click, daily time spent, etc.